You are here: Home » Reviews » Hygiene Products » Sonicare Toothbrushes–worth the money or a waste? Years ago, I volunteered to get my teeth cleaned by a dental student of the University of Louisville. This was an awesome deal for both of us–I got my teeth cleaned for free (and a cavity filled) and the dental student got a subject to help him pass his boards. As I was not very wealthy at the time (and I’m still not), this was a very crucial time for inexpensive dental care and other things. Needless to say, I was not in the market for any type of toothbrush outside of the traditional manual toothbrushes. A friend of mine let me know of the program, and I’m grateful that she did. This particular time was the second year that I volunteered. The first year, I was a bit terrified that a student with little experience was going to be doing something to my mouth. But these students were pretty accomplished. The first year, my fears were dispelled a bit. I went in, got my teeth cleaned, got examined by the instructor/tester, then I went my own way to my apartment, never to see that student again. The last year, though, a student was particularly appreciative that I stepped up to the plate. He presented me with a Sonicare toothbrush. I had used powered toothbrushes before–I like them better than traditional manual toothbrushes. I feel like my teeth get cleaner with them, so I do prefer them when I can get my hands on one. My problem, though, is that I always ended up buying the cheap ones that didn’t last for very long. I know now that I should have put my money on one that was good quality, did the job, and was built to last. Now that I was presented with the Sonicare toothbrush, I was going a step in the right direction. I want to first look at the concept of most electric toothbrushes. Most are battery-powered. Most have heads that either spin or “slide” back and forth to help facilitate cleaning your teeth. The heads that spin are usually smaller and round so that the circular motion is possible. The spinning can either be continual or more of a twisting back and forth. My wife had one of these for a while. I got my own head for it and used it when we traveled. The one we used felt like someone was doing a drum roll on my teeth, but I didn’t feel much cleaner afterward than if I had used a regular toothbrush. The other type can have a longer head. The bristles slide from the tip end of the toothbrush down towards the handle in rapid succession. I preferred these to the spinning heads by quite a bit. This is the type I spent my money on when I had it. How do Sonicare Toothbrushes work? Well, the concept of the Sonicare toothbrush is quite different. Rather than relying on the back and forth scrubbing motion, sonic toothbrushes rely on high-speed vibrations. Some sonic toothbrushes can get up to 62,000 brush movements in a minute (according to Sonicare’s website). This helps clean your teeth in not one, but two ways. The first way it cleans is the traditional scrubbing you would expect with a toothbrush. The bristles contact the teeth and scour them, and the friction helps remove plaque and other debris from the teeth. The second way is dynamic fluid action. This is what makes the sonic technology really special. The waves from the brush help clean beyond where the bristles reach! These “microbubbles” reach between the teeth and along the curves of your teeth. With this component, your teeth have the potential of getting 10 times cleaner than traditional brushing. I’m happy with how this technology works above all other electric toothbrushes. To give you an indication of how great this technology is, I want to share with you an exchange I had with that friend. 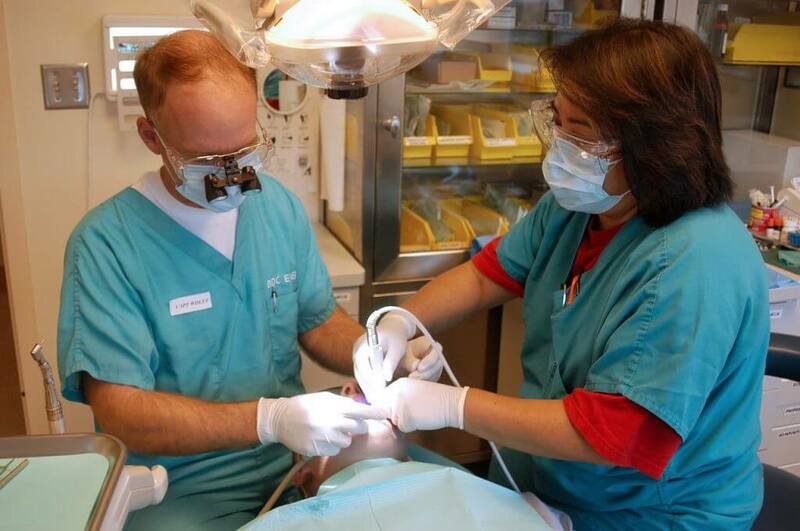 I visited the Dental School and saw how some of the students were working on periodontia. I watched a student take a dirty set of dentures and put it in this machine. Once he put it in the well of the machine, I heard a loud humming sound as it did its work. In no time at all, the dentures came out completely clean. I remember saying, “That would be awesome to have at home for my mouth!” My friend then said, “You have that in your Sonicare toothbrush, actually.” The same ultrasonic technology is presented in the toothbrush. This made me quite a fan! Watch as this ultrasonic technology cleans a carburetor! This one is very nice! It has a 2-minute timer and a 30-second quadspacer. What this means is that it is basically that the toothbrush times you. It gives you 2 minutes to brush your teeth (to pace yourself) and gives you 30 seconds each for top front, top back, bottom front, and bottom back (totally two minutes). This is especially handy when you want to maximize your brushing time. This will allow you to brush slow enough to get everything, but quick enough to do the two-minute brush. In between each 30 seconds, the toothbrush beeps and stops vibrating briefly. This indicates to you that it should be time to switch positions. Now, I believe that $340 may be a bit much to spend on a toothbrush. However, there are lots of other options that I think ARE worth it. The indicator on the front works both as a speed indicator (for multiple speed options) and charging gauge. It comes with a charging base that you just sit the toothbrush in (no connectors or anything!). The heads are easy to replace. I’ve been happy with this toothbrush for years and will get another Sonicare to replace it. My teeth are left feeling clean each time, and my dental checkups have been a lot more positive. Now, I believe that $340 may be a bit much to spend on a toothbrush. However, there are lots of other options that I think ARE worth it. 1) On the low end, you can get the 2 Series Plaque Control Toothbrush. At the time of this post, they are $39.99 before a $10 coupon at Amazon (Great Deal!). The 2 series can clean up to 6x better than traditional brushing. It has a two-color charging indicator, and can do up to 31,000 brush strokes per minute. I’d go with this one myself if I were to upgrade. It’s priced just right and still does what I would need it to do. 2) If you wanted to spend just a little more money, you can go for the Flexcare Platinum. What’s nice about the Flexcare toothbrush is that your brushing experience is customizable. In addition to your 2-minute timer, you can also select from three modes and three intensity settings. My toothbrush has this, and while it’s nice, I don’t ever use it myself. If you want that flexibility, this toothbrush is the one for you. The technology behind this brush brings the claim that it can clean up to 10 times better than traditional brushing while the 2 Series says 6 times. This toothbrush currently has a $20 coupon on Amazon, making the price $139.95! 3) A third option (which is awesome if you have the money for it) is the DiamondClean toothbrush. If you are really into tooth whitening, this is the toothbrush for you. I honestly would go for the other two, myself. The extra benefits (for me anyway) don’t outway the cost in my opinion. Are the Sonicare toothbrushes worth the money? Yes. Spending $30-$170 is better than getting that root canal. But, I’d go with the lower end of things before I splurged for the $100+ Models. I think you’ll be happy with the choice. I know I am! I look forward to your comments. Do you use Sonicare? What are your experiences? What questions do you have? If you like what you saw, please share on Facebook or other social media! I love these toothbrushes–my son’s orthodontist said he absolutely recommended these while his braces are on, and I think they’re wonderful for everyone. An older friend has poor oral hygiene and has to have 3 root canals and has a bacterial infection in his jaw. Don’t mess around with your teeth!!! No kidding, Hillary! I just published a post about how bacterial infections can affect more than just the mouth and jaw! Thank you for your comment! Thank you, Jewleonna. I wouldn’t have been a fan 10 years ago. But now they’re so worth the money!